Three weeks after his 39th birthday, Germany's Juergen Braehmer slowed down the Tick-Tack Master once again when he convincingly defeating previously unbeaten but ultimately untested American import Rob Brant via a wide unanimous decision over twelve mostly forgettable rounds. The fight, which defined the last of the World Boxing Super Series semi-finalists, took place in Braehmer's backyard - the Sports and Congress Center of Schwerin, Germany, his hometown. On the other hand, Braehmer had a significant challenge to overcome as he moved down (not UP!) in weight at a very old age by boxing standards. The last time he boxed as a super middleweight was more than ten years ago, and all of his major titles after that - WBO and WBA light heavyweight - were captured one division above his original weight class. The last time a marquee fighter made such a move was in 2012, and it turned into a disaster for then-reigning light heavyweight champion Chad Dawson, who was obliterated and the stopped by 168lb king Andre Ward. To make things worse, Braehmer was coming back after his first career stoppage loss (although it had been injury-induced) to Nathan Cleverly more than a year ago, and he hasn't fought since. Amazingly, it didn't matter much either, as Braehmer showed few signs of rust after the opening bell rang. Fighting oppositely to a majority of German boxers, Braehmer set his goal at imposing his will onto inexperienced Brant, 27, who made an opposite step up in weight for this fight. The southpaw stance helped the German's case as he was too awkward and too distant for the lesser Brant. Educated right jab troubled the American every time he chose to shorten the distance. Instead of actively breaking into the close range, Brant looked negative and passive, not trying to overwhelm Braehmer with his activity. The American was arguably better in the first only because of some poor balance for the home fighter. However, Braehmer took the next several rounds and was well ahead on scorecards by the midst of the fight. Brant was unable both to find his range and to land something big, not if he really tried to though. However, his actions were enough to have Braehmer's nose terribly bleeding in the seventh rounds. The German, who has seen it all inside the ropes, paid little attention to those mild problems and continued his stalking of Brant. The American had some slight chances during the last quarter of the fight but Braehmer showed consistency and grit to lift any questions regarding the winner. Interestingly, his facial damage was much more visible than that of Brant, with his right eye cut, nose bleeding and eyelids swollen. It didn't helped Brant though, who was well behind after Jimmy Lennon Jr. announced the scorecards: 119-109, 118-110, and 116-112 - all for the German fighter. Brant (now 22-1, 15 KOs) failed to become WBSS' version of Andre Ward. The WBA #2 / WBO #3 middleweight will now be back to his native weight class. 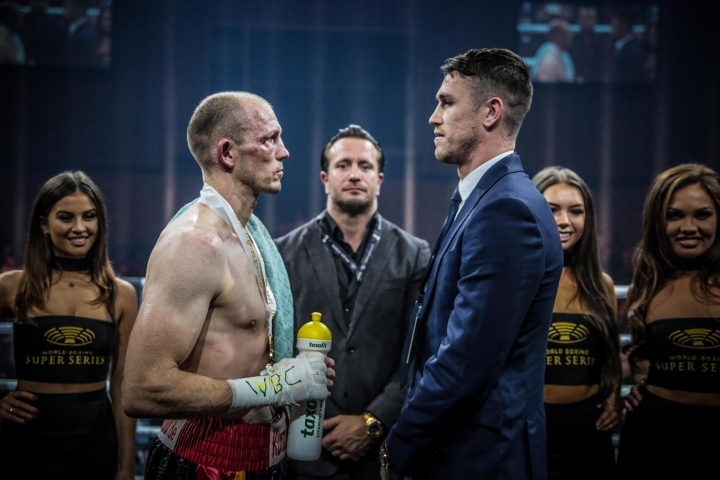 Next for Braehmer (49-3, 35 KOs), who was rated #12 by the WBC (as a super middleweight), IBF #10 and WBA #14 (both as a light heavyweight), will be a showdown with British Callum Smith, who was in attendance. Damn I hope Braehmer doesn't expose Callum Smith too. “Yank robot hypejob exposed by slick DDR bruder”.